We have carpenters and handymen available throughout London who are ready to help with any type of repair to external or internal wooden doors. They can be scheduled to start fixing your problem straightaway. Our expert tradesmen will do everything they can to save you money by repairing a door rather than you having the expense of replacing it. Our tradesmen’s workmanship comes with our 12-month Aspect guarantee. When you book an Aspect carpenter or handyman you can count on getting the professional expertise you’re looking for. We’re fully trade accredited. Aspect is a member of The Guild of Master Craftsmen, the Federation of Master Builders and the Glass and Glazing Federation. We’re also members of FENSA, the UK’s largest and longest established Competent Person Scheme within the replacement window and door industry. This means we are able to fit windows and doors and self-certify the work in accordance with relevant Building Regulations. 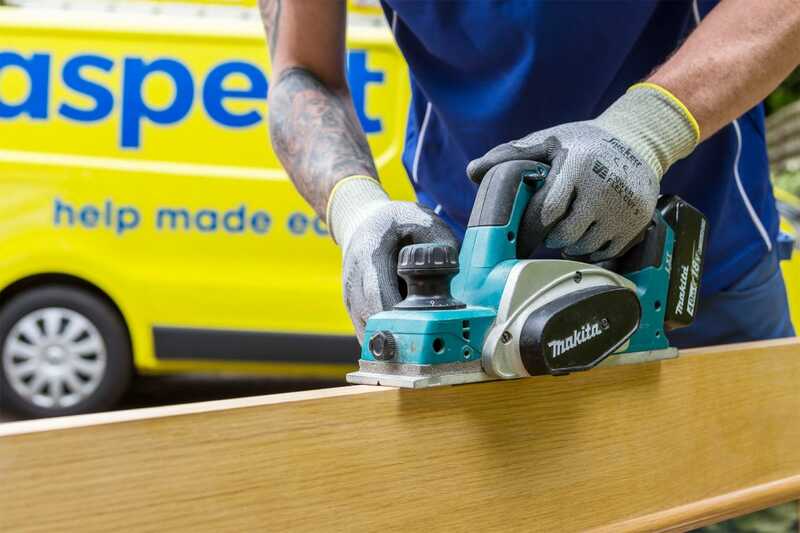 As well as repairing door furniture, such as hinges, locks and bolts, our expert tradesmen can also repair damaged timber, either in the framework, or the door itself. If you’ve been unfortunate enough to experience a break-in, we’ll treat your job as an emergency. We’ll aim to be with you quickly whatever time of day or night, including weekends and bank holidays. Our tradesman will work quickly to secure your property. Depending on the parts and materials needed this might be a temporary solution. Our tradesmen carry standard parts in their vans. We’ll source any other replacement parts quickly from our huge network of suppliers, and install them the same day we get them. We’ll replace all locks for you and will offer advice and recommendations on how you can increase your levels of security.